It is easy to imagine that many directors view Jarry’s Ubu Roi as the poisoned chalice of theatre. It is a play whose own history has overwhelmed any value the original content may have had. A play that managed to start a riot after just one word of dialogue had been spoken. A play that managed to get itself outlawed from the stage after just one performance. How can a play with that much power ever be resisted for long? However power relies on content and context, and even directors blinded by its potential must realise that theatre audiences of the 21st century are not going to tear up the stalls upon the utterance of a single swearword. So the question always remains over how to make Ubu relevant whilst maintaining its sense of absurdity; this must be the prerequisite of any company attempting to refresh the play. So then we must be glad that it is Cheek by Jowl who are the latest in a long line of companies to have picked up the gauntlet, as it is questionable whether there are more potent re-interpreters working in theatre today than the formidable pairing of Declan Donnellan and Nick Ormerod. Over the last few years they have put their unique design and directorial decisions to plays as unfashionable as Troilus and Cressida and Racine’s Andromaque. They have also delivered stylish but substantial productions of The Tempest, Macbeth and ‘Tis Pity She’s A Whore. Most impressively of all, this has been achieved whilst working across three languages, using British, French or Russian almost on a whim. One of the joys of a new Cheek by Jowl production is the anticipation of what you are going to get. Each new play feels unique in itself but also contains an essence that is instantly recognisable as Cheek by Jowl; there is a coherence and balance in the interplay between design and direction, style and function, which means that each individual element has a purpose and a decision that runs through and underpins the unifying themes. This ability is particularly noticeable in Ubu Roi where the need to produce unnaturally large characters means that there is a constant tension that they could overwhelm the play as a whole. It is interesting that it is using the same core cast as Andromaque. In Racine’s wonderful, if under-appreciated, tragedy, formalism takes precedence and there are recurring echoes of the stiltedness of ancient Greek theatre. The stillness and an underplayed noble grandeur from the cast help to reinforce the tragedy, which was set against a suitably Spartan backdrop. This could not have been further away from the extravagance required to replicate the absurd grotesquery inherent in Jarry’s Ubu. All the cast are excellent in Ubu but special mention should go to Christophe Grégoire and Sylvain Levitte (Ubu and Boggerlas respectively). They both contain a physical malleability that makes the initial switch between reality and fantasy breathtaking to watch; their faces take on a rubberness that gives the impression of a melting waxwork being reformed and recast over and over again, as if in some nightmarish vision from David Cronenberg. The set, at least to English eyes, couldn’t look anymore French; it contains a sleek, chic design palette that screams the kind of taste that wouldn’t look out of place in a film starring Kristin Scott-Thomas. It is against this backdrop of middle-class bourgeois normality that the absurdity springs forth – and this is taken quite literally, as the elements of the set and the house form a vital function in propelling the play as an adolescent fantasy of the ‘father and mother’s’ teenage son. The audience are treated initially to an extended tour of the house via the son playing with a video camera. The father is seen preparing dinner, close-up on the pulping of tomatoes; the mother attending to her make-up; the toilet viewed in disturbing detail. These images of violence, sexuality and puerility pre-figuring the content of the play. The scene is protracted in the best history of European film-making – it takes the audience to the edge of what is comfortable, continues going and further on into a zone where relief and fear become almost indistinguishable. 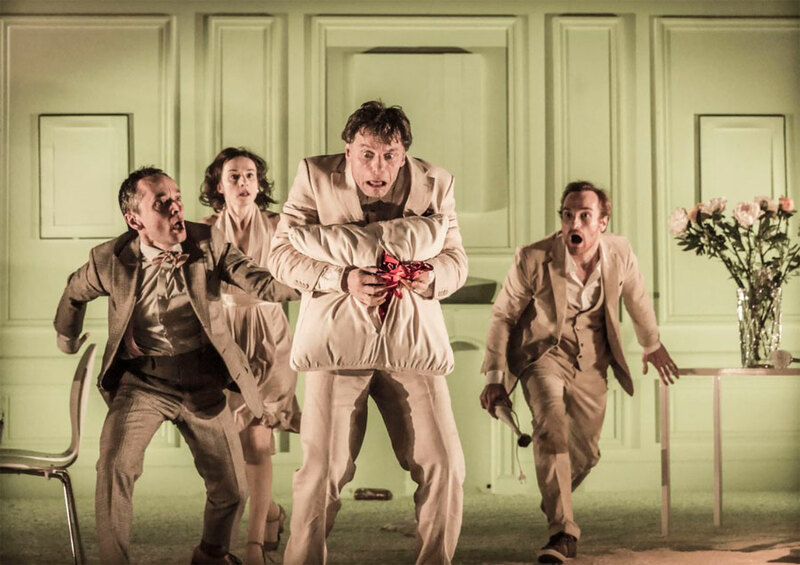 It is the perfect opening to the play – whereas the absurdist content may have fallen flat by going straight into it, here it breaks the tension that has been building in the audience. Donnellan and Ormerod have worked hard to produce this dislocation and one of the undoubted masterstrokes is to have taken the decision to continue jump-cutting back to the idea of a modern-day dinner-party. Without even subtitles to follow, the audience views a dinner party of utter mundane normality taking place in the middle of a slowly disintegrating set. It begins to raise the challenge of what part should be taken to be absurd and what part reality. The jump-cuts also allow the team to reveal the true power of the production, which is to shift the focus of what the play is about and provide a context that suddenly seems terrifyingly relevant to modern audiences. 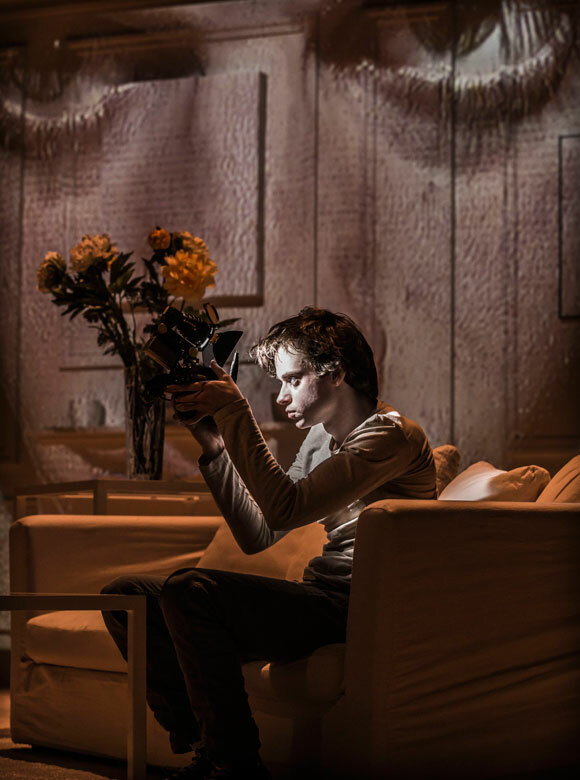 The play itself is driven as the fantasy sequences of the teenage son. The use of video camera, and the set itself, bring memories of Haneke’s ‘Funny Games’, which is itself a notoriously, deliberately challenging film. This must be an intended reference point, and is one of the few modern pieces of art that has come anywhere near to challenging the shock of Jarry’s original Ubu Roi. 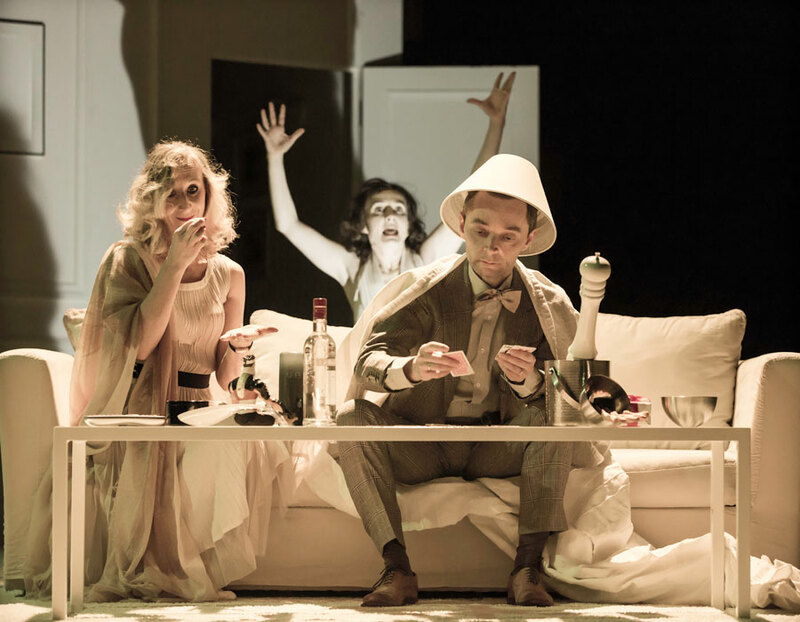 The end of Cheek by Jowl’s Ubu Roi suddenly remind you of Haneke and the nature of audience complicity – in essence we have been sharing and enjoying the son’s boredom and his flights into fantasy, and we are being challenged by where it must end. The fact that the dinner party then continues brings a question mark over where the blurred line of absurdity/reality sits, with the final actions appearing to take place in reality. We are left with the relatively unpleasant solution that the play continues to reverberate around the mind of the teenage son. It may not be possible to ever recreate the outrage that audience’s felt about Jarry’s originally production but Cheek by Jowl must be duly celebrated for having to capture something akin to the shock and unease that must have been felt back at the play’s original 1896 premiere.